Haven’t had a chance to listen yet, but a trailer on tv last night looked/sounded interesting. 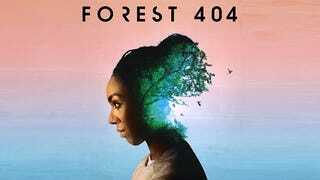 Doctor Who’s Pearl Mackie is back, this time in an innovative science fiction thriller from BBC Radio 4 - Forest 404. This is an ambitious 27-part podcast series with theme music by Bonobo. The series is accompanied by a national experiment looking at how listening to natural sounds could boost wellbeing (which reminds me of the Recording Group at the old firm who used to go out and record all the sounds the world could throw at them). Forest 404 is a first for BBC podcasts. The three-tiered structure creates a new listening experience to draw the audience deeper into the world of the podcast. At the heart of the project is a sci-fi thriller, which depicts a world where the earth’s forests have been erased from history. Each episode of the thriller is accompanied by a factual talk which guides listeners through different themes of the drama and an experimental soundscape. The thriller features an all-female cast led by Pearl Mackie (Doctor Who), also starring Tanya Moodie (Sherlock, A Discovery Of Witches) and Pippa Haywood (Bodyguard, Green Wing). It is produced by an award-winning creative team: writer Timothy X Atack (Bruntwood Prize Winner), BBC producer and director Becky Ripley (Third Coast Award, Prix Europa Award), sound designer Graham Wild (Bafta Award-winner Blue Planet II, Planet Earth II). It was commissioned for BBC Sounds by Radio 4’s Digital Commissioning Editor Rhian Roberts. Set in the 24th Century following a data crash called The Cataclysm, Timothy X Atack’s thriller follows Pan (Pearl Mackie), a sound archivist who uncovers some sound recordings from the early 21st century that haunt her. They are recordings of rainforests, places which no longer exist, and Pan feels compelled to hunt down the truth about how the forests of the old world died. Each of the nine talks is delivered by a wide range of speakers including musicians, biofuturists, bioethicists and anthropologists. They delve into the themes which inspired the drama, such as: “Why should I listen to trees?”, “Would you vote for an AI government?” and “What is death in the digital age?” to explore the real-life ideas which inspired the drama. The soundscapes designed by Graham Wild and Becky Ripley, which bring each episode of the thriller to life, are mixed in binaural to create an immersive 3D experience for the listener. A rainforest symphony, an orchestra of frogs, a montage of whale song and a sonic woodland walk make up some of the sounds of nature which sit alongside more experimental soundscapes as the narrative unfolds. “Podcasting gives us the chance to play with sound and form away from the classic radio schedule,” said Rhian Roberts, Digital Commissioner for Radio 4. “It allows the whole shape and format of Forest 404 to be genuinely experimental. Podcasts also have that ability to pull us into a very close relationship with a story - we wanted the layered approach to draw listeners even more deeply into this twisted futuristic world. Launching today and running alongside the podcast is one of the biggest national investigations conducted into the therapeutic effects of sound. Forest 404: The Experiment, led by Alexander Smalley, a Virtual Nature Researcher at the University of Exeter, hopes to develop a unique insight into how the British public respond to nature-based sounds. The experiment is an nQuire survey built in collaboration with the University of Exeter, University of Bristol, funded by The Arts and Humanities Research Council and hosted by The Open University. Talk 1: Why should I listen to trees? Alex Smalley on the mental health effects of being in nature. The Sumatran rainforest recording that Pan finds. Pan goes on the run from Daria and The Hands to find answers deep down in Fumetown. T2: How is the sound of the world changing? Cosmo Sheldrake on how humans are changing the sound of the world. The chorus of frogs that Pan plays to the Interlocutor. Pan finds an illegal brain shop to uncover how the recordings have changed her. T3: Could I live in darkness? Herman Wijnen on life without sunlight. A full playout of the whale song that sent Pan to sleep. Daria and The Hands close in on Pan as they race towards The Oil Lake. T4: Why do trees live so long? When Pan sees her first ever tree. James Aldred on ancient trees. A British woodland thick with birdsong. T5: Will we all become cyborgs? Andy Miah on what cyborgs today can tell us about humanity’s future. A soundscape for Episode 5. Theia’s Hometown, 22nd Century St Petersburg. In fear of seeing another civilisation self-destruct, Theia uncovers the truth behind Pan’s journey. T6: What is death in the digital age? Katie Thornton on what happens to our digital selves when we die. A full playout of Pan’s dwindling as her system shuts down. Daria has a confession to make - a secret from her past that haunts her every night. T7: Would you vote for an AI government? Elsa Sotiriadis on whether AI could run the country. A full playout of one of Daria’s nightmares as she tries to control the sounds of the rupture. Pan and Theia have a plan, but it’s a sketchy one and it’s probably going to go wrong. T8: How will humans die out? An ode to Theia. Anthropologist Michael Rivera on human extinction. Theia’s salty memory of her daughter used for the transfer. Daria escorts Pan to The Convocation. An era has ended. Can, or should, a new one begin? A love letter to the forests of the world. Written by David Haskell, read by Pearl Mackie.